Erica Bunker | DIY Style! The Art of Cultivating a Stylish Wardrobe: Belk | Bright Now! 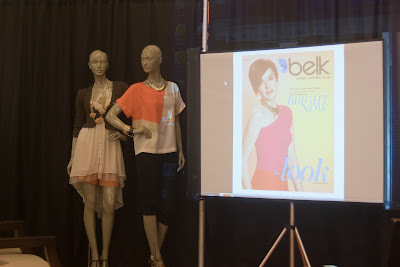 On yesterday, I attended Belk's Spring 2012 Fashion Tour with VP Trend Merchandising & Fashion Director Arlene Goldstein. It was so much fun and extremely informative. You guys know I live for fashion and trends and to not only read about, but to have someone take you by the hand and tell you what's hot was pretty great. A timeless nod to the classics, this trend is built on simple sportswear elements with authentic nuances that reflect a chic, modern vibe. Streamlined and architectural, Shape Shift, the next statement, offers maximum style with minimal effort. Asymmetry, strong angular sleeve treatments, obtuse layering and stand collars are just a few of the dynamic details that define Shape Shift. Next, from romantic, soft hues to lingerie affects and garden florals, it’s bloomin’ beautiful and Belk is calling it, “So Pretty.” Look for handcrafted touches, tonal embroideries, corsage embellishments—ruffles and pleats add the perfect touch to this romantic spirit. Lace, the ultimate in fem fabrics, continues to increase its approval rating. In the next days, I'll go more into detail about these trends. They are pretty awesome... no matter if you plan to buy RTW or sew them up yourself. How awesome! Can't wait to read more! It was great! It's a lot of info and too much for one blog post! Thanks! I'm excited about "So Pretty." Some of the spring McCall's patterns would be perfect for that. I look forward to the rest of your articles. Also, do you know if that fringe cardigan is available in the store now? I think so. I think they pulled all of those looks from the floor. I love Belk!! I am addict. Your blog has inspired me to take a sewing class.